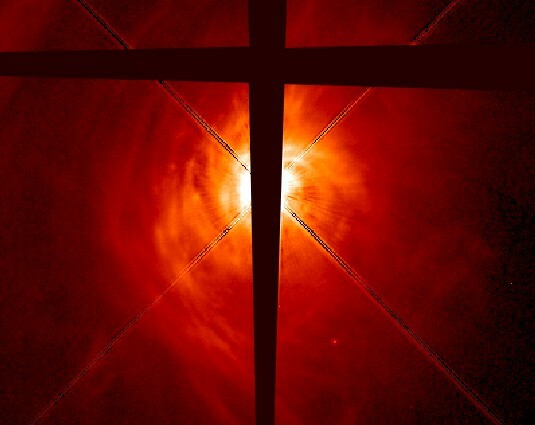 Explanation: This enhanced Hubble Space Telescope image shows in remarkable detail the inner portion of the disk of dust and gas surrounding the star AB Aurigae. Knots of material, visible here for the first time, may well represent an early stage of a process which could result in the formation of planets over the next few million years. AB Aurigae is a young star (2-4 million years old), about 469 light-years distant. Its swirling circumstellar disk is large, about 30 times the size of our solar system. Astronomers believe planet-making is just beginning in AB Aurigae's disk because known disks surrounding younger stars (less than 1 million years old) do not show such clumpy structure, while disks of slightly older stars (aged 8-10 million years) have gaps and features suggesting that planets have already been formed. Why the window pane appearance? Wide black stripes in the picture are caused by occulting bars used to block out the overwhelming starlight and the diagonal streaks are due to diffraction spikes.